And do animal mothers love their babies? YES! YES! Of course they do. Animal mothers love their babies, just as yours loves you. I thought this book would be perfect for Vegbooks because it asks children to relate to the love their mothers feel for them and feel compassion in the process. 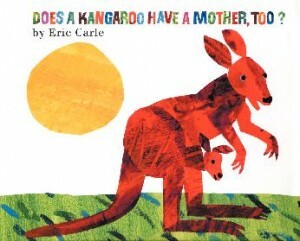 As with many Eric Carle books, there is an informational page in the back, this time listing the animal baby, mother, father, and group names. Did you know, for instance, that a group of monkeys is called a group, troop, or tribe? My favorite new (to me) fact is that a group of giraffe can be called a tower. What have you learned lately from reading a children’s book? I learned from Steve Jenkins’ book Just a Second that every minute, 59,000 barrels of oil are used — the U.S. is responsible for using nearly 15,000 of them. I learn a lot from the Magic Treehouse books. I just learned a little about the history of St. Bernard dogs this week while reading Dogs in the Dead of Night. We love the magic treehouse books, great pick! I love the companion guides as well. I remember the rainforest one being especially interesting.